First, let’s begin with a brief history of stompy. For those of you that haven’t heard the term: “stompy” has always referred to a style of deck that is green, with lots of little creatures doing big things FAST. Its creatures have great evasion. Its spells and creature enchantments are second to none. It should be noted that both these deck builders had vastly different opinions of what should stay or leave. Aclog’s build was more concerned with evasion, ghweiss’s more of a beat down. Both have valid arguments. A) My opponent went first AND had a nuts hand. B) I was mana flooded, or mana screwed. can accumulate faster than 20 life can be lost. White weenie is pretty even, unless they have Standard Bearer - then it's "GG" for them and "GO" for you (game over). All is not lost, so long as your Shinen of Life's Roar can take out their Standard Bearer! Elves is an absolute backbreaker and almost unwinnable. Good thing it's rarely seen! Mono black isn't as bad as you'd think. Silhana shines here and can win you the game solo, but if she doesn't show up, and you take too long, the Crypt Rats unearthing tricks will quickly kill you. So what makes this deck so special? What makes it tick? Well the cards for one. Just imagine if I told you that the magic card, Force of Will was pauper legal. You’d probably send me to the closest Cabal Surgeon to get my head examined, right? Well - call the minions because I’m saying just that. Only this ‘force of will’ isn’t blue, and doesn’t cost you any life. This counterspell happens to be green AND free. The first card you need to fully understand stompy is Gather Courage. Sure my ‘force of will’ logic is a bit flawed in certain circumstances…I'm just trying to open your eyes to how impactful some of these spells are within a game. Gather Courage will not counter a creature spell. Gather Courage will not counter an enchantment spell. However, Gather Courage will counter just about anything else, and for free - so long as it’s pointed at a creature you control. - And those are just the most obvious and popular! Furthermore, if I told you green had access to Fireblast you’d upgrade me from the Cabal Surgeon to undergo Deep Analysis in the mindstab ward. Yet this is true… AND it has the benefit of not costing you two lands in the process. Groundswell from Zendikar provides the Fireblast punch for a measly G casting cost! With the help of Quirion Ranger – landfall usually isn’t an issue. So two of the most powerful spells, Force of Will, and Fireblast are available in one convenient mono-colored package. Oh, AND they're cheaper! You still need more prodding as to why stompy is king? Well instead of going outside the color green as the above two examples did, let’s examine what treats await us within the green sector shall we? Rancor has to be one of the best creature enchantments ever to go on a creature. So long as it sticks, it’s bound to have a powerful impact on the game. Especially lethal atop Silhana Ledgewalker and Skarrgan Pit-Skulk, this creature-booster feels like you're playing 4/4’s on turn two, not something most decks can deal with - and even if they can, Rancor comes back to do it again on turn three! Moreover, many times these 4/4 (or higher) bodies are unblock-able! Vines of Vastwood is about as blue as you can get for a green deck. If you're patient enough, you save your creature from death, AND upgrade it to steroid gym class for a quick turn – costing your opponent a valuable removal spell, and boosting your creature by +4/+4 all for the cost of GG. Everyone knows Wild Mongrel is insane, more so due to this partner in crime Basking Rootwalla being in the same deck. The mongrel's ability to change colors is very important when facing an opponent with Prismatic Strands in the graveyard. Also, the Wild Mongrel is especially savage when his friend Quirion Ranger is on the board (see below) - feeding him a steady supply of juicy forests, even more so if he has a Shield of the Oversoul in his maw! Silhana Ledgewalker is my favorite card in the deck. I’ve argued this card with other stompy players 'till my fingers hurt. Ask anyone who hates stompy what their most hated card is, and this will be atop the list. Vs. anything with cloudposts maindecked, this single-handedly wins… sure they may fetch some trick like Seismic Shudder, but with a hand usually full of boosting instants, this is a problem very easily avoided. Furthermore, this is the card that goblins can’t kill OR block. This is the card storm decks can’t target and/or bounce. This is the card that sticks around, loves Rancor and loves being unblockable and lethal the majority of the time. Sure, by itself it’s a 1/1, but in a deck with this many tricks and stat-boosters, Silhana is one sweet mama. I'm surprised she can fit on a ledge when she gets upwards of +9/+9, you'd think the ledge would break and give way! Yet, so many times a player will keep a creature back, thinking they have the game if they can just block Skarrgan, NOPE. This creature allows for no tempo loss in the attacking mindset of a stompy player. The first few guys go in, the opponent gets his defense set up, and this guy just keeps swinging from his bloodthirsty perch. A silent assassin behind enemy lines that hits like a freight train with the help of the above spells. Rogue Elephant is aptly named in my build. Believe me; I’m usually all about having four-ofs in all my past decks. This is the exception. Many times this guy comes out games two and three. But in the rare case you’re flooded, or when you know you’re facing mono-blue, mirror or traditional storm etc.., this guy is great. 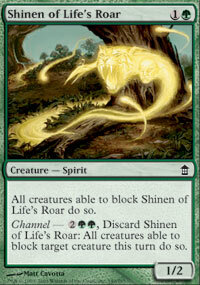 Shinen of Life's Roar is green's version of removal. Imagine a “MUST BLOCK” coming at your team with Rancor and a surprise Groundswell out of the blue! Even worse, if Quirion Ranger is out, it can untap any guys your opponent has and thought were safe from this one-sided wrath of nature. This card particularly shines vs. affinity (killing their Disciple of the Vault), goblins, white weenie and familiar storm. Quirion Ranger is the sleeper mvp of the deck. It allows a tight ‘goblin-esque’ land count, while adding consistency to draws with only one land. This guy has won me so many games via his tricks. Tap your only forest, target the ranger, bounce land… play it again and tap again for another mana (totaling GG). Better yet, on defense this guy is the law. There is one universal truth regarding the deck stompy – it is NOT easy to play. Many of you out there may see an upsurge in this deck, due to either this article and/or my recent success with it – but let me assure you if you win against stompy, don’t pat yourself on the back too quickly, odds are the pilot wasn't so good. The comparison is best visualized by a Formula One racecar… anyone can sit behind the wheel and get their picture taken, but how many of us are truly ready to race over 140MPH? We may try, but we're likely to get killed! I personally believe stompy is the hardest aggressive strategy to play correctly. Let me be clear, I did not invent this deck. Like many others, I took a list and changed about ten percent of it to fit my magic theories and play style. I can't stand cards like Nissa's Chosen. I agree a card like Garruk's Companion is awesome, there is just no room left for two-drop creatures in this deck... and adding more will slow it down and allow for defeats. Give yourself a lot of time to play stompy. Play very slowly. Look for all the possible plays at each stage of the turn. Are you tapped out? Odds are you can still do about three to four different tricks, if the ranger is out you can probably cast another creature or two! After the latest tournament changeups Magic Online has implemented, Pauper Premieres are few and far between. Sometimes these big events are weeks apart. The little four-round daily tournaments are good for practice… but there’s nothing like a six to nine round grind out, with even more rounds within the top eight to prove your deck's worth! I long for those old days. In 2010, Magic Online had one premiere event a week! At the time of this writing, it’s over five weeks from the end of one premiere event to the beginning of the next one. So that’s why I was so stoked to finally get a chance to play in one like the old days! And on February 19th, 2011, I did just that! (Each of the videos below represents one round of the tournament. Many games went 2-1. Round two was a bye. Round one was depressing. I sat across from mono-black and lost a close one 1-2. What a lousy way to begin a tournament! Sideboard cards like Shield of the Oversoul shine here, as does Silhana Ledgewalker and Wild Mongrel so long as it turns black to escape Doom Blade. I hate having a bye. Sure it's a 2-0...but does nothing for my tiebreakers and serves to really mess with my tournament mojo after having just lost. I want some REVENGE, not sitting for an hour! Traditionally I'm about 82% against this deck, so long as they don't have the nuts. The key to this matchup is Shinen of Life's Roar, as well as Silhana Ledgewalker for mid game. Early on, Nettle Sentinels shine with the help of Gather Courage really reducing goblins numbers while preserving your own. You win this match up with quality. Take down their volume, and win the grind. Quality vs. volume. Fog is mvp vs. this and affinity after sideboarding which usually goes like this, +3 fog, +1 or 2 Shield(s), - 3 Vines, -1 Rogue Elephant. If you scroll down, you'll see I faced this deck a whopping FOUR times. The key here is speed, and believe it or not, the mvp is Shinen of Life's Roar. This card is a house vs. this deck and causes them to lose valuable mana tempo (due to the death of their familiars). Thermokarst from the sideboard reduces the chances for a familiar storm deck to pull out a victory, and the icing on the cake is Silhana Ledgewalker due to her shroud ability, and (Basking Rootwallas) for when they bounce everything back to your hand. Normal decks are devastated by this, but stompy can sometimes cast up to five creatures mid-late game in this matchup due to the rootwalla's crazy-cool madness! I often side out two Bonesplitters, one Rogue Elephant, two Gather Courage for an additional shinen and the land destruction package. You have to remember to "BE THE PROBLEM." This is always close. Traditional storm has game vs. everything - much like stompy, thus it usually comes down to who the better pilot is of each deck is and who goes first! Obviously Thermokarsts come in, as does Sandstorm and/or Fog. Easily losing Vines of Vastwood, Bonesplitter, Silhana Ledgewalker. Remember they can't block Skarrgan Pit-Skulk the majority of the time, so if you're facing an army of 1/1's, think the victory through before scooping. Fogs and Thermokarsts buy you the turns to kill, while Sandstorm can simply win the game. This is the only deck I bring in Sandstorm for. You can always discard it to the mongrel for damage if you're winning. Additionally, avoid trying to gain life. Stompy needs to "BE THE PROBLEM" and cards like Nourish and Sylvok Lifestaff seem good vs. this and strategies like burn, but the logic is misguided and will result in you still losing, and winning even less since you've diluted your focus and intentions. The finals was against "Omarvelous" playing, you guessed it... familiar storm (yawn). He's a great pilot and game one proved it with him easily winning. Game two I smashed him good... which led us to game three shown below. I used to play familiar storm a lot - its main drawback is it often loses to the clock! I knew this going in, and was further delighted to see that the new event time/round is only 25 minutes now! So I made sure to chat plenty and used F6 every chance I could to wear down his clock. but this was the first time I ever did it without attacking! I realize you're right about Shinen of Life's Roar, taking into account your advice and will try to do some upgrade to the deck, if possible. "So I made sure to chat plenty and used F6 every chance I could to wear down his clock. Doing things like activating your ranger every turn can really add up!" Good job, I guess. In a paper tourney, you'd be DQ'd for Stalling for doing this. The clock online is a totally legitimate constraint (and the primary difference between paper and digital play), but going out of your way to purposefully manipulate the rate of play is pretty low. Encouraging others to do likewise in an article is even worse. If you go back and look at the chat log in the video, you can see that your finals opponent is clearly aware of (and unhappy about) you gaming the clock in what is probably a lost position. Sure, it's a premier event and it's competitive play and there are prizes on the line, but do you honestly feel like you won that game? You're clearly a good player with a strong deck that demolished a fair number of people along the way to the finals, and maybe I'm old fashioned, but I just feel like that should be the thing that matters. Totally valid points. A friend of mine wanted me to leave that part out of this article, but it's what I did to win, so I felt it should be included. Time, like in chess, is a win. As I wrote, I won vs. that deck many, MANY times that very day - sure I would have loved to run him over, but it was my only out. If "time" wasn't a valid win, there wouldn't be a clock. You misunderstand the intent of the clock. It's there so games WILL come to an end. But using it to win is like infecting you opponents computer with malicious software. He can't play (therefore win) anymore, but it's not you superior gameplay that did it. Agreed. But it was my game play that did it the other 5 times he and I played. It was my only out for a big PE win, so I took it. I'd feel stupid not doing so, unless wizards starts handing out 'boyscout' tokens that are worth much more than a windfall of boosters. I'm here to win. I can't watch your videos because I'm at work, but I still wanted to comment on the time issue. Personally, I have mixed emotions about it. On one hand, if we were playing paper, I'd be calling a judge over to my opponent for stalling. On the other hand, I've had many players, who are obviously playing in multiple events, waste my time only for me to watch myself lose with them having less than a minute on the clock. If players play slow or play controlling decks or if they are multitasking events, they should expect to run out of time in some circumstances. Online time is 30 mins each player, whereas paper is 50 mins between both players. If you can't win online in your alloted time regardless of what your opponent is doing with f6, then so be it. Maybe you need to play faster or play a different deck. Edit: The problem online faces is where you win game 1 and then time out, just like with paper you should earn the win in that case. The problem with that theory is that then stalling would be a huge issue. I just don't understand players who time out because I've sat and watched and played countless CounterTop matches (which is like watching paint dry) and I've never seen one go to time online. Great points. I agree with you too, I even wrote while playing him, that I didn't like that deck cause of time issues! I COULD have posted the vid of the first game where I won on turn 4, but that wouldn't have been very different from the other vids where I was winning. I doubt anyone in my position, seeing a few minutes left, would be like, "...ok, here' you can win, I'll conceed cause you can't manage to play to time." hey, you guys are all unrealistic. we have a clock. it is a way to win the game just like damage decking and poison. If you are going to join a tournament and pay tickets to win prizes, you will take any advantage that the opponent gives you. If he is playing sloppy thats on him and you win. if he misclicks, same. but if he runs around the apartment or plays slow during the match its my fault when he times out? give it a rest. personally i have never ever timed out in a constructed match. omarvelous should have managed his clock better, played with it instead of against it. also i liked the article. To be perfectly honest, the game clock is a completely legitimate way to win. It's not like you're hiring someone to run over to your opponent's house and disconnect their internet connection, or deliver them a pizza and distract them from the game. If your opponent isn't being smart with their clock, and you are, then you deserve the win. And compared to paper magic, MTGO is actually far LESS about winning through means other than pure Magic playing. Mike Flores just posted an article about playing a huge mind game with an opponent that spanned 2 games, and got his opponent to agree to a draw when he clearly had the better matchup. That is FAR more nefarious and underhanded than simply playing quickly and letting your opponent run out his clock, and this is coming from a Pro magic player. Most pro players have similar stories. When you play Poker, and you are dealt cards, and then you frown and slump in your chair, do you get upset if your opponent assumes you drew a bad hand? Would he have a right to complain if you did all that just to bluff and you actually have a royal flush? I had an experience awhile back where my finals opponent deliberately disconnected after the 2nd game in our match where my tech against his deck came into play and forced a win. (Volcanic Falloutx2 (in Naya Elves) vs Combo Elves). He waited until he had very little time left on the clock and almost timed out after coming back from the sideboard time. He then proceded to combo out in 4 lightning quick turns while I tried to top deck one of 8 sweepers to stop him from doing so. I had 24 mins left on my clock. He had about 29 seconds on his when he won. Did I get unlucky? Sure. I metaed against his deck (Tribal Wars btw) specifically and was rewarded with one perfect game and two not so great games. (First game saw us go about 39 turns before his huge number of elves and tokens were able to finish me while I kept hoping to draw my sweepers.) I did feel cheated a little since he pulled a tantrum before coming back to win. But mainly I shrugged. I had to admire his ability to come back from a fairly demoralizing loss and win it all. The only other thing I have to address is: Honor. Being a purely subjective ideal there is little point in discussing it with those who do not see it the same way you do. Your sense of integrity prevents you from acting in certain ways. Theirs doesn't. Neither of you will convince the other that your way is better. a sense of honor is one thing, but this is a competition. There is no honor in losing a game you should win because you want to handicap your self. the clock is a resource. you dis honor your self and your opponent when you let them win because of some pre concieved notions of morality. If it were me i wouldnt conceed to time and neither would my opponent if i had a winning board and 5 seconds. again this only applies to prize matches. While morally I do you have a slight discrepancy with winning through time, i can overlook it in a tournament for prizes. Beisdes I can think of many PDC events were I was playing Mono-Blue aggro, and would win with less than 30 seconds due to the deck combined with my gameplan. I have also won due to time, but never felt bad about it. As I said, it is very subjective. No way to gauge how others should or shouldn't behave. No one can fault you for wanting to win and as long as it is legal it is fine. Just some people are picky about how they win. Just a small point of critisism: In watching a lot of the videos I noticed lots of significant play errors with the deck. As the point of the article is to inform people about the deck, you might want to point out the places where you made mistakes in the videos(we all make play mistakes, so no biggie there) so that people do not emulate the same errors. There were a few mistakes indeed. Feel free to point them out. I sometimes dislike feedback like "coulda shoulda..." - simply because it never ends. At some point you need to post the article. I spent a TON of time doing this with graphics/vids etc.., trying to give a good face to a site that has, quite frankly, really low quality overall, and writers more concerned with credits than quality. I played a few games with the deck. It's definitely good against all the Post decks and Frantic Storm. Given your listed weaker matchups, though, and given that I also had some Affinity and Burn problems, I wonder about a few of the card choices (mostly in the sideboard). For one thing, Hidden Spider doesn't seem terribly useful in matchups that matter. I'd rather have Gleeful Sabotage for Affinity and maybe MUC (kills Spire Golem and Serrated Arrows). I'd rather have a variety of cards including Scattershot Archer for Faeries. I assume Spider is also there for White Weenie? Also, has anyone considered sideboarding Hornet Sting? Pointedly, you mention needing to use the Shinens to kill dangerous guys like Disciple of the Vault, Standard Bearer, and Familiars (including, presumably, Nightscape Familiar). Hornet Sting takes out each of these problem cards, no tricky business needed, for one mana. It also kills Sparksmith if Goblins doesn't have a pumper, and it kills Quirion Ranger in the mirror (seems important). Plus, it kills Faeries, and unlike many of the other solutions to Faeries it can surprise-blank a naked Spellstutter Sprite. I note that none of the above-shown Stompy decks tried this card. Is there really enough reason not to turn like 2 of the Forests into Khalni Gardens? They're quite good with Rancor and Bonesplitter, and okay with the pump in general. They also help against black deck builds that rely on Innocent Blood/Diabolic Edict. The number of times that I have been slowed down by this change is quite small so far. You're already running more Forests than either other shown build of the deck. Thermokarst, while it seems like it would be fantastic, has been hard for me to use quickly enough to be relevant, so far. Three mana is just a TON for this deck to hit by turn 3, and by turn 4 it's not that relevant. Frantic Storm and Post decks both seem like extremely positive matchups without it. It's sacrilege, of course, but what about cutting this from the board? Moving on to less-likely changes, given all the pump in the deck, is Shinen really better than the half-priced Taunting Elf? I'd guess probably so, given Shinen's ability to handle 1/1's without pump, but has this been tested to see? KingRitz - Great observations. Hidden spiders are for MUC and WW variants..VERY needed, and far superior in testing to any archer tricks. The hornet sting is a valid card to choose, I just want as much 'bang for my buck' with regards to sideboard slots...and those hit a variety of decks. Thermokarst isn't hard to cast at all, especially with ranger's help. Perhaps your feeling it is slow due to the Gardens. I don't like the gardens... they're more of a 'win more' card that slows the tempo dramatically. Of course there are cases one can make when topdecking one while holding a rancor is great, but we can argue that to death back/forth. Comes down to play style. Stompy is super aggro, and I played with gardens for months, always wishing they were just a forest, and less of them too! As many builds run 3. Timewalking yourself turn one for a 0/1 isn't great imo. Re: affinity, I rarely lose that matchup. Fog is mvp for both this and goblins (As stated in article) so I feel other players "auto include" artifact hate cause they think they should...but in playtesting HUNDREDS of games...it's simply never needed. Well, you have a lot more experience with the deck than I do, but I guess I don't quite see some of it the same way. I will say, Thermokarst being slow had NOTHING to do with Khalni Garden. Aside from slowness, I also found it rather irrelevant. I'll test more, I suppose. How long did this take you to make? This is the best looking article I have seen on here. Every visual is nicely done. The information stuffed in here is massive, and having the videos makes seeing how the deck play a lot easier, well done sir well done. I looked it up, this deck costs less than 20 tix. This makes me want to splash up the norm of just a few graphics in the deck lists, and take it up to look like something on in a magazine. I have to admit, I really do like the graphics you used. I actually had your playwright article open while I was writing my latest piece, just to help me with making it better. But Im still jealous over the quality of your graphics. Any tips that dont include paying that website you linked money? The worst thing for me is mispelling in a graphic, since I'm a horrible speller...MUCH harder to fix than a typo! I was in a SOMx3 draft once and I was playing against someone who had drafted both a Koth and Elspeth. The only way I could possibly win the match was to throw as many creatures as I could against him, and he was a little slow doing stuff, so I won the match with 5 life in the third game and his clock reached zero. I know its a cheap win, but when you are facing that and the one rare you drafted was Grindclock and it was one of the last cards I got, I'll take a clock win against that kind of drafted deck any day of the week. In constructed games, you should beat your opponent. If you don't do it, it seems like a cheap win. It makes one feel like they aren't good enough to win and can only do it by wasting time and forcing your opponent to press OK every 10 seconds. The only time a clock win is good is when you have a guy beat so badly he just wants to leave his computer on and make you wait 30 minutes. Then you know you just beat the guy and there is nothing he can do. That deserves a Mortal Kombat "FInish Him". Since I normally come in here to tell Pauper authors to do better, I have to compliment you on an article well done. A shining example that I will point other Pauper authors to when they write quicky money-grab articles. In particular, I must hand you credit regarding Shield of the Oversoul + Wild Mongrel; I had never thought about that particular interaction before! However, a word of warning for everybody: if you change the mongrel's color away from green, he will no longer be indestructible. Damage is not removed until end of turn, and if he stops being green, he will stop being indestructible, and if he has lethal damage, he will die as a state-based-effect. It would be interesting to see you do a followup article on MGA Infect, or "Infectious Growth" and compare and contrast, as the two decks are such close cousins. Thanks for the nice article. Having now played 7 matches vs. Affinity, I have to question how much you've actually played against "new Affinity" decks with Atog, Carapace Forger, up to 8 maindeck burn spells, and often Perilous Myr in the side. I'm 1-6, and frankly I'm sure you're going to call me a bad player and/or point to small sample, but I tend to know what I'm doing, I have experience with similar decks previously, and none of these matches have been particularly close -- in fact, my opponent misplayed both losses of my only match win. If they cast Atog, you lose. If they cast a 4/4 on turn 2 and another on turn 3, you lose. I've also never managed to kill a DOTV; they have burn for the 1/2 or they have Springleaf Drum (and yes, I am aware of the Ranger tricks). I've won three total GAMES in these seven matches. I think you should massively re-evaluate this matchup. Totally disagree. Sleeve it up online and challenge me online anytime. Best of 3 games we'll do...no biasing the board etc.., just bring the new affinity (which I've faced many times) and we'll see. The same argument goes for me, atog for the win, stompy casts fog, wins everytime. Shinnen swings with groudswell, stompy wins everytime etc.., all matchups have their 'nut' draws/plays. Affinity is a great deck, I just don't need any artifact hate to beat it. My ratio vs. it is 10 wins 3 losses, all in tournaments. I'll also point out that the cat's out of the bag on Fog. Nobody is ever going to go all-in on an Atog while you have green mana up. I mean, maybe it worked before, and maybe that explains some of the different record, but it's not terribly effective nowadays. Usually they are almost dead, so they have no choice. We can argue this to death, or we can sling it out. Also, Shield of the Oversoul is insane vs. Affinity, causing atog to lose an artifact a turn (at least, more if on mongrel) while you can even go aggro and untap it via ranger to play defence, basically giving it indestructable vigilance. Just like with temporal storm, the more 'answers' they bring in, the slower they play out. Also, the new affinity has ZERO flyers, and silhana usually takes it if any of the above 3 scenerios don't happen to occur. Fog is nothing new..>I used to laugh at it, but it demands answers, and vs. stompy, you have just a few turns to do so. Awesome article first of off. Second I've been meaning to chat with you online for some pointers on how to play the deck. RCueva - that's why I wrote this, to avoid having to re-write this to every person that chats with me on mtgo :) - which is flattering, but a sometimes feels like a pestermite! No offence, I'd be happy to answer a few questions...but the above should be more than enough imo. Truly excellent article - well-organized, with lots of food for thought and beautiful, purposeful visuals. Stompy is one of my favorite deck archetypes, I played it a lot when it first showed up (Urza's Saga block). I'm no Pauper expert but the thoughts on card choices and match-ups looked sound to me. You can always argue about some details, but that happens with all decks. I like pauper, so I liked the content. That it also looks good is appreciated. I've always liked running singleton Whiteout and snow lands any time I'm running mongrel, but seeing as how land light stompy is supposed to be I can see why it wouldn't be run. I was quite impressed with the mongrel/shield tech, I would frequently abuse mongrel for various colors in games and still hadn't considered it. I had to look up 'Whiteout' - not that you meant it, or implied it - but I fail to see how this could be remotely tournament worthy. Hidden Spiders are insane against any air-based strategy from MUC to WW and some others thrown in. If fliers are your aim, there's much better cards to set your offensive sights on. I think the top choices are 1) Hidden Spider, 2) Scattershot Archer - the first being a CRAZY superior choice for winning...anything else is fun for a casual game, but if your serious about winning, look no further than H.Spider. His point for whiteout had nothing to do with fliers. The card allows you to sacrifice all of your lands for +1/+1 to Wild Mongrel. "Sacrifice a snow land: Return Whiteout from your graveyard to your hand." ah, was in a hurry. Great point! Didn't see that before sorry guys. Just wrong card for this style deck imo. Great maybe in Green/Red. I liked your article alot. As others have mentioned the pictures are great and I also liked the videos. Good job! The majority of the time new players lose with stompy, instead of focusing on their play abilities/weaknesses, they're ever so quick to add/subtract new cards, and THEN claim how terrible their results are. This is not a deck for someone looking for a casual game, or wants to throw it together and "Just see..." - you seriously need to set aside some time for reflective game replays, and even have a friend or 3 critique your play, then after a few WEEKS, MAYBE, join a tournament. 2/3rds of Magic is sideboarding...and again, sideboarding stompy is quite the art form - and I'm still learning where I put my paintbrushes sometimes. I hate to beat this point over the head, but as I can see online, many folks are not 'getting it'. This is not green goblins. It is NOT EASY to play correctly. I was looking for a reliable pauper deck, and yours is really great. Only downside is that I lost 3 of 3 matches against affinity. This problem mentioned already somebody, but since affinity is very popular, I would really love to hear about how you see the match. What do you board, and how do you play against a possible krack-clack-shaman (whatever the correct name is... ;) )? I bring in one more shinen, the shields and fogs, losing vines, elephant and bonesplitters. Affinity is always close, if they come out strong AND have the shaman, it's pretty hard to win, but it's also hard for them to recover many times as they have to sac SO many so early. Just need to not overextend, which isn't a problem with stompy, as the instants make the attack, not the volume as seen in goblins. Shinen and ranger make them have to trigger the shaman/disciples asap. Usually a skargaan or ledgewalker takes the game for me. You swing for 8, they do, repeat, and fog. Even if they 'play around' fog, you still get the fog benefit of buying you time for your unblockables to go to the dome. Overextending is the obvious thing people do wrong vs. affinity. They have to sac the shaman, AND an artifact or two to get rid (maybe)of your one guy, not something any deck can do much of and win. Nice article, a lot of graphics! I am trying out the deck myself to later blog about it. I don't see the use of hidden spiders, couldn't that be the spot for something to hate affinity? Crumble their early land seems decent. Crumble: G istant, destroy target artifact, its controllers gains x life, x=cmc of the artifact. Tried stompy and have interesting results. I know I still need a lot of practice, but I had difficulty with the red/black deck that sacrifice creatures with act of treason. My biggest problem was they are able to put a lot of creature with mogg war marshall and other. At the same time, with their removal well played, I can't use my pumps as they just wait and kill my creature doing a 2 for 1 at the same time. My only solution is the Ledgewalker, (and maybe the sandstorm but by seeing my hand with the mesmeric fiend, they play around it). Any advice on this matchup or it's just my play I need to improve? I dont think I have ever played against the deck you mentioned. I have played 29 matches so far, and 21 wins (72%). I went 4-0 in todays daily - and I even defeated affinity (Shield of the Oversoul is key!). No offence intended, but it sounds like stompy isn't your style if your losing to that. Once in a while with terrible flood etc.., maybe, but it shouldn't happen even 2 in 20 times.